Make cooking part of the family culture. The family meal can start in the kitchen as you cook together. Family meal preparation is an opportunity to celebrate your cultural heritage by passing down recipes. Help your kids find new, seasonal recipes to add to your repertoire and family cookbook. Cooking together and prioritizing health over the convenience of processed food are great ways to lead by example and help your children buy into a culture of wellness. Building daily and seasonal traditions around cooking together helps strengthen your family's commitment to a healthy lifestyle. Keep it safe. Teach kids the importance of staying safe while cooking by showing them how to hold kitchen tools safely, how to use oven mitts to protect hands from heat, and how to turn appliances on and off safely. Always supervise children when cooking to ensure they are sticking with safe and age-appropriate tasks. 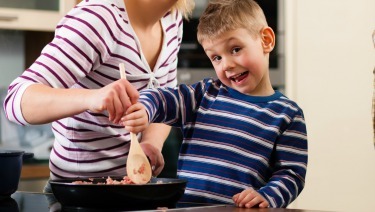 The best way to keep cooking safe is to know your child's abilities and his or her stage of development. A four-year-old child, for example, may not be ready to sauté vegetables over a hot pan, but may have the fine motor skills to rinse fruits or tear salad leaves. Keeping safety in mind, it is not difficult to get kids—even toddlers—involved in the kitchen. Ask for input. Children feel more included in mealtime when they are asked to be a part of meal preparation. Collaborate with your kids when selecting recipes for main dishes or sides. Let them help you make the shopping list and find groceries in the store or farmers market. When cooking together, let children offer a critique of the foods you are preparing. Together you can decide what ingredients you should add to enhance the flavor. Talk about how people enjoy different tastes, and share your preferences with each other. Letting children be "in charge" of details like how to set the table will help them feel invested in mealtime. Over many years, cooking as a family will help develop a happy, adventurous eater with some pretty valuable life skills—and plenty of happy memories in the kitchen. With enough practice, your child will someday be able to cook YOU a delicious meal! Nimali Fernando, MD, MPH, FAAP is a practicing pediatrician and the founder of the Doctor Yum Project, a nonprofit organization that provides cooking instruction and nutrition education to families. She is also the co-author of "Raising a Healthy, Happy Eater" and owner of Yum Pediatrics, a general pediatrics practice in Spotsylvania, Virginia which features a teaching kitchen and garden and focuses on prevention of illness though nutrition education. Follow her on Twitter @Doctor_Yum.